There's a website called Tripadvisor.com that allows travelers to offer "objective" reviews of the places they've stayed in. 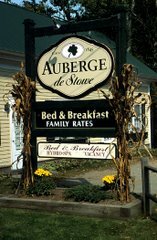 Ostensibly, this service helps others decide where to book a room when visiting a place such as Stowe. While on the surface this seems a good idea, there's really nothing objective about the idea. In fact, the site relies on the subjective experiences of its users to offer advice--advice they may not be qualified to give. Once we fielded a complaint through AAA from someone who had stayed with us. Actually, it turned out not to be a complaint, just a matter of opinion. The person who wrote to AAA, listed among her complaints a pink toilet in her bathroom. Not a dirty toilet, or a broken toilet, but a pink toilet. She also mentioned the layout of the rooms, and the fact that many things looked old. Of course, we had the same thought you're having right now: "Soooo, is this going somewhere?" It didn't. While it's obvious that this person didn't care for pink toilets or old fashioned furniture, it said nothing about the quality or service we offered. Though most of our reviews on Tripadvisor are positive, you can see there's room for abuse, or at least subjectivity. Where's the harm in letting people tell other people about the experience they've had? Well, there's none, except that an opinion is just that: a view or judgment about something, not necessarily based on fact or knowledge. It's the "fact or knowledge" part that gets sticky. What one person craves, another abhors, and if someone books a room at a roadside inn for eighty dollars, then doesn't like the fact that there's no turndown service, and writes about it online, there's not much you can do about it. And the opposite is true, too. Inflated reviews may paint a picture of an inn that isn't really there. I haven't even mentioned the ethical pitfalls inherent in this model, like trading free room nights for favorable reviews. Yikes. All this innkeeping stuff leads me to a review of my own. The first real review of my book, Name the Boy, came out in the Stowe Reporter today, and it was a lot like the lady who was shocked to find a pink toilet in her bathroom. The reviewer seemed focused on the surface elements, and never made it to the rich subtext. And though the reviewer never said anything bad, the impression left was that this might not be a book you want to buy, it's too scary. In Hollywood they say there's no such thing as bad publicity. But this is Stowe. I guess I'd hoped for a deeper reading of the book, but the review came off as rushed. I thanked the reviewer for the effort (after all, the paper donated nearly a square foot of type to me, which is no small feat), and told her that if she ever needed someone to review a book, I'd be happy to do it. (Hint.) What I learned today is that book reviews are like family members: you don't get to pick 'em, and once they're here, they're yours to keep.